Kelly Loeffler, CEO of the long-awaited new crypto exchange Bakkt, announced on the last day of 2018 that the company had closed its first funding round, with $182 million received from 12 partners. Among the investors were familiar names from the crypto world such as Galaxy Digital and Pantera Capital. More interestingly, Microsoft’s venture capital arm is also getting involved as well as the man they call “Superman” in Asia, Hong Kong tycoon Li Ka Shing, through his Horizons Ventures fund. Ka Shing’s superhero status was earned by building an estimated $3.4 billion personal fortune from his large conglomerate holdings company, CK Hutchison Holdings. This latest news once again highlights the steady influx of smart financiers from the mainstream investment world into the crypto space. 2018 was the most active year for crypto in its brief ten-year history. This was evidenced by rising investment in distributed ledger technology and digital assets, as well as by blockchain network metrics such as daily bitcoin transaction value and active addresses. Yet, these milestones tend to be overshadowed by the more narrow focus on bitcoin’s price, which has been seen by some, as a proxy for the potential of the technology. It’s worth noting that major technology shifts prior to 2000, such as the advent of cell phones in 1980’s and commercializing the internet in the 1990’s, didn’t develop with the scrutiny of real-time digital headlines and tweets. More importantly, the company stated it was awaiting a regulatory “green light” for its upcoming futures contract but was continuing to onboard customers. 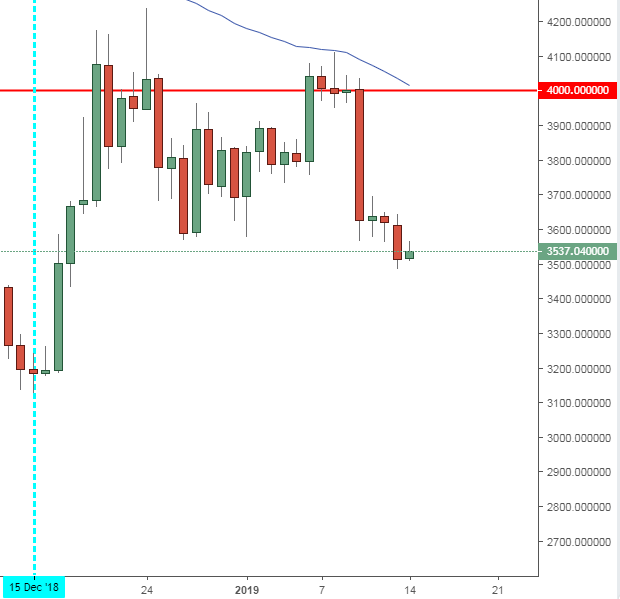 Bitcoin’s recent rally has faded with a failure to hold gains above the $4,000 level. This makes the lows of December 15th critical for BTC going forward. The low was reached exactly a year from the 2017-18 high, which makes it a good place for a long-term low. A failure to hold another test of that level would likely lead to further losses. We still don’t know the reason. If the attacker didn’t run it for profit, he might be a white hacker who wanted to remind people of the risks in blockchain consensus and hashing power security. The hack was uncovered by Chinese blockchain security firm SlowMist and led to some weak action for ETC over the last couple weeks. The selling did not occur with any large volumes and the coin is now retreating from a recent rally with a similar price action to Bitcoin. ETC is currently trading around $4.30. This is a big week for ETC and its namesake Ethereum with the Constantinople upgrade expected to happen on the 16th of January. The upgrade brings some important changes and is aimed at improving speed, efficiency, and price. ETH is also trading lower at a price of $119 after recent highs of $160. As mentioned in BTC, the mid-December lows need to be respected and will dictate the next direction. The Winklevoss twins are also still excited about crypto’s future after they spoke with Fortune. The pair were talking after their first marketing campaign, “Revolution Needs Rules”, hit newspapers and billboards. Stablecoins are an area that the Winklevoss twins are particularly hopeful about, although they did release their own offering with the Gemini Dollar (GUSD) last year. GUSD has now grown to a market cap of $86 million since its inception. This ranks the coin at 48 in the list of coins by market cap, still well behind the most popular stablecoin, Tether, which has a value of almost $2 billion. Tether’s market cap took a hit last year after long-time rumours about the integrity of their dollar holdings surfaced once more. The other key stablecoin is the USD Coin by Circle. That offering sits at number 19 with a market cap of $373 million. Allaire spoke of a tokenized world, where “every form of value storage and public record becomes a crypto-token” that has free-floating market value and can be traded on global digital exchanges. Allaire envisions a world in which property, cars, and art can all be tokenized as well as social infrastructure such as voting systems moving to blockchain, which would be more transparent and immutable. 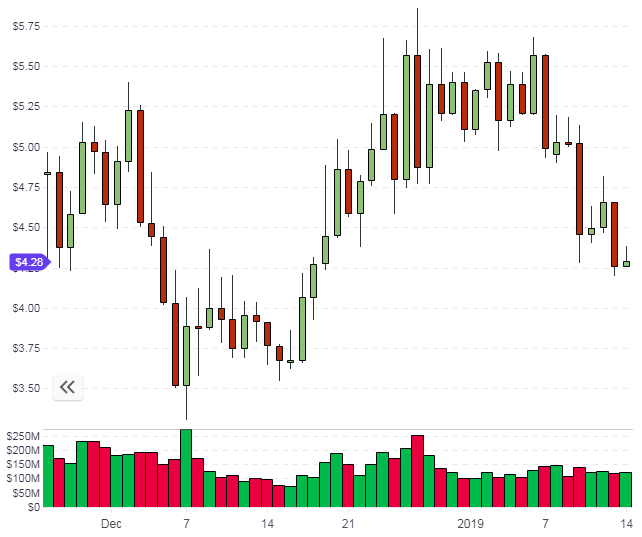 For now, the next two weeks could confirm or negate the mid-December lows in crypto prices. Despite the struggling market, big moves and promising developments are still happening in the background.